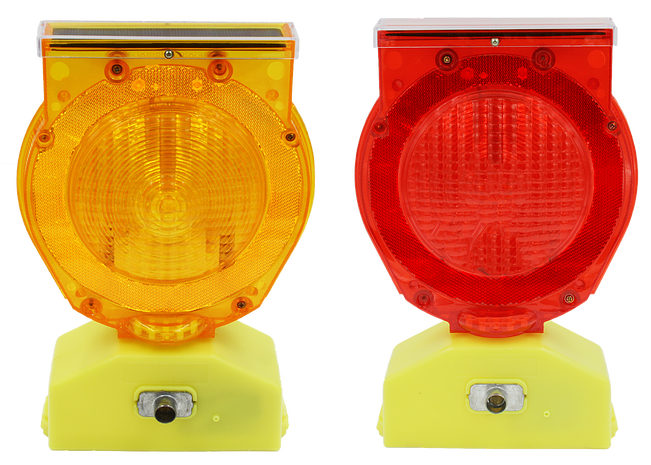 This full time warning light works for all road, construction projects and many innovative applications such as, oil derricks, detour alters, airports, clear line delineations, and railroads. This unit is bright, easily visible during the night. For lights easily visible during the day, check out our Type B Barricade Lights. This light is made of durable Polycarbonate. Solar Flash/Steady Burn comes ready to install and completely assembled. There is no WIRING necessary. Universal hardware included (bolt, fastener, tool to turn off/on). This light has Flash and Steady Burn in one unit (just press one button to toggle between off/flash/steady burn). These are battery free, correct? These lights have an internal re-chargeable battery that is charged via sunlight. They do not need to be replaced as they would typically would after 2-3 months on a battery powered barricade light. 2-4 years is the average. Two years is basically the minimum life for these, and they have been known to last over four years, but 2-4 is the average range. How much sun do they need to work? After 6 hours of good sunlight they will be able to shine for three nights straight. We do not get much sun where these are going to be used, will these still work? There have been instances where these units were submerged under water for an extended period of time and still absorbed enough sunlight while underwater to flash during the night, so in most cases this unit will work for you no matter where you are using it. Do these flash during the day? Do they turn off automatically? They do not flash during the day; they have a photocell which forces them to shut down automatically when the sun comes up. This means no having to go around and shut them off manually. Do you carry barricade lights which shine 24/7? Yes, please check out our main barricade light category page for Type B barricade lights which can be seen during the day as they are high intensity lights. How do these mount to objects? Can they mount to ____? With this unit you get a bolt and a fastener. The bolt threads through a hole in the base of the unit and through a hole in the object which you wish to mount it through, and then gets fastened on the other side. These can mount to most traffic safety products including barricades, barriers, looper tubes, ringtop cones, traffic drums, vertical panels and more. What is a better value, solar barricade lights or battery powered barricade lights? Solar barricade lights are better in the long run if you plan to use these for about 9 months or more. The cost to replace the batteries as well as the labor involved with the battery powered lights adds up to a point where it is worth it to buy the solar version.